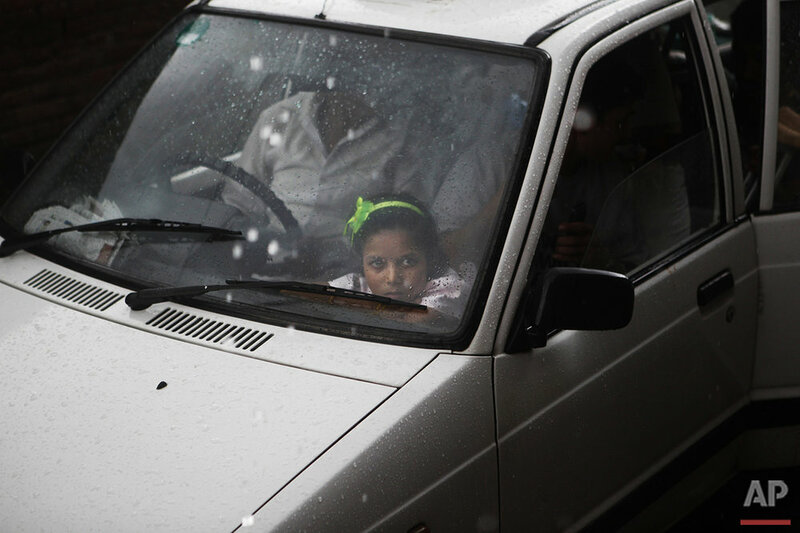 Associated Press photographer Niranjan Shrestha chronicled the lives of two young Nepal earthquake victims for several months after the April 25, 2015, disaster. The sounds in the trauma ward of Bir Hospital two months after the Nepal earthquake were hard to take: The screams of patients suffering with fractured bones, or mourning for amputated limbs, as helpless family members attempted to comfort them. I couldn't bring myself to take out my camera and point it at people here, so instead I tried to comfort them, too, and listen to their stories. I was drawn to a corner of the ward where a young girl missing a leg was smiling while doing physiotherapy. She was the only patient with a smile. That was the first time since the earthquake I felt such deep contentment. Nirmala Pariyar, now just 8 years old, lost her right leg. A few days after my visit, I returned to see Nirmala and her family. "Uncle, you're back again," she said, flashing me that smile. I followed Nirmala and her family over several months. One day, I saw another 8-year-old girl, Khendo Tamang, lying in the bed next to Nirmala. She was crying and holding her mother, whose faced showed her anxiety. Khendo had lost not only her left leg, but her elder sister and grandmother. The parents of both girls decided to keep them together. Seeing Khendo helped Nirmala realize she was not alone. But Khendo needed more convincing. Nirmala tried her best to plant a seed of hope in her, cracking jokes, or making weird faces to elicit a smile. Slowly, it worked. Every time I went, I saw small changes in Khendo. Slowly she, too, started to smile. The girls started to call each other "Sathi," which means friend in Nepali. They never called each other by their names. They were like neglected flowers that finally were tended and slowly bloomed. They were two bodies, each missing a leg, but leaning on one another for support. When they separated for the first time from the hospital, they were both happy to go home to their relatives, but Khendo started to cry. It was a bittersweet moment for both girls, though they would continue to see each other, since both still needed to get prosthetic legs. After many months in the hospital and rehabilitation, the day arrived to get measured for the prostheses. While the doctors prepared their tools, the 8-year-olds joked and played. They took their first wobbly steps as their parents watched their daughters finally back on two feet. The physiotherapy would continue, as their amputated limbs were not yet strong enough to hold the new legs. But they were on their way. 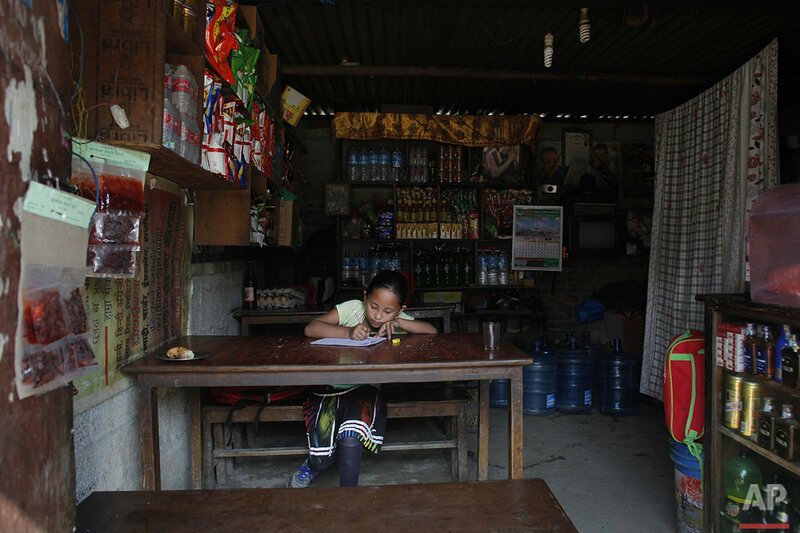 "I don't think my daughter will lose hope," said Chitra Bahadur Nepali, Nirmala's father. "She is a really strong kid." There has been so little rebuilding in the year since the earthquake; so few success stories. But these two girls showed me how strong people can be. How two downtrodden souls can find support in one another. How one small angel can help her friend stand and see the beauty of survival. Text from the AP story, Photographer's view of young Nepal quake victims' friendship, by Niranjan Shrestha.